HÀ NỘI — President Trần Đại Quang and President Donald Trump discussed measures to enhance relations between Việt Nam and the US in a more practical and effective manner during their talks in the capital city on November 12. He hoped Việt Nam – US relations will continue to grow based on respecting the respective independence, sovereignty, territorial integrity and political institutions of each side. 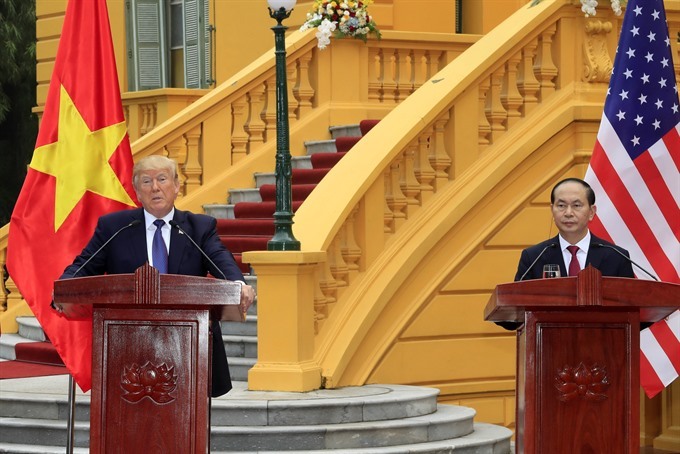 President Trump expressed his pleasure on visiting Việt Nam for the first time and said the US attaches great importance to the friendship and comprehensive cooperation with Việt Nam. The two Presidents agreed that the establishment of the bilateral comprehensive partnership in 2013 lays an important foundation for Viet Nam and the US to reinforce their ties. Promoting economic, trade and investment ties will continue to be a focus of the bilateral comprehensive partnership in the future, contributing to growth and employment in both countries. Việt Nam and the US agreed to increase high-level delegation exchanges and promote the efficiency of existing cooperation mechanisms while considering the establishment of new appropriate ones. The two sides will step up cooperation in other fields such as the settlement of post-war consequences, people-to-people exchanges, science and technology, education and training, and security and defence. President Quang thanked the US for its prompt assistance to Vietnamese flood victims and hoped the US will strengthen coordination with Việt Nam in humanitarian aid activities and natural disaster relief in the future. Quang and Trump welcomed the two countries’ efforts to complete the detoxification project at Đà Nẵng airport and plan to soon implement similar ones at Biên Hoà airport and other locations. They affirmed that Việt Nam and the US share common benefits in maintaining peace, stability, cooperation and development as well as respect international law in the Asia-Pacific region, while agreeing to increase coordination at regional and international forums. President Quang thanked the US for supporting Việt Nam in its successful hosting of the APEC Year 2017 and proposed the US push ahead with relations with the Association of Southeast Asian Nations (ASEAN). President Trump congratulated Việt Nam on the successful hosting of the APEC Economic Leaders’ Week 2017 and highly valued the role of Việt Nam as the host of the event. Regarding regional issues, the two sides stressed the need to maintain security, safety and freedom of navigation and aviation in the East Sea. They agreed to address disputes via peaceful means in accordance with international law, including the 1982 UN Convention on the Law of the Sea (1982 UNCLOS), while respecting diplomatic and legal processes, implementing fully and effectively the Declaration on the Conduct of Parties in the East Sea (DOC), and soon signing a Code of Conduct (COC) in the East Sea. Việt Nam President Trần Đại Quang and US President Donald Trump discussed measures to strengthen and expand the Comprehensive Partnership between the two countries based on mutual understanding, shared interests, and a common desire to promote peace, cooperation, prosperity and security in the Indo-Pacific. Both leaders affirmed their support for enhancing people-to-people ties to strengthen mutual understanding, cooperation and friendship between the two peoples, including through professional and academic exchanges, the launch of the Fulbright University Việt Nam, $500,000 in the Việt Nam Education Foundation (VEF) alumni grants, and the arrival of the first ever Peace Corps volunteers in Việt Nam. The United States will acquire the “D30” site in Hà Nội for the construction of a new Embassy facility, in accordance with the laws of both countries. President Trần Đại Quang thanked the United States government for the transfer of a Hamilton-class Coast Guard cutter to help improve Việt Nam’s maritime security and law enforcement capabilities. Both leaders welcomed the plan for the first visit to a Vietnamese port by a United States aircraft carrier in 2018. They affirmed the 2018 – 2020 Plan of Action for US – Việt Nam Defence Cooperation to implement the 2011 Memorandum of Understanding (MOU) on Advancing Bilateral Defence Cooperation and the 2015 Joint Vision Statement on Defence Relations. Both leaders expressed grave concern over the DPRK’s nuclear weapons and ballistic missile programs and tests, which violate United Nations Security Council resolutions and threaten international peace and security.